Free ground shipping on all orders of $75 or more! This Narrow version Badass 16-Hole Steelie beadlock wheel is narrower than your average beadlock wheels. At 21mm wide, they are suitable for tires that are about 30mm or less in width. This Badass 16-Hole Steelie is inspired by millions of factory vehicles around the world. 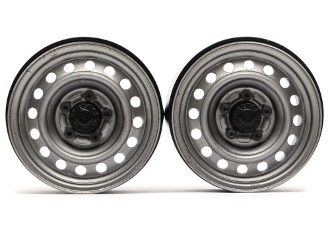 Create the stock truck look you can imagine with these realistic scale steelies. The front face is made of pressed steel for accurate scale looks. The rear is made of CNC aluminum for the high quality finish. This rear version comes with the standard hub design. A special tool is included to install the wheel. Available in these finishes: Black, White, Gun Metal. Align the steel plate and the back beadlock half and use two M2X10 screws to guide the assembly. Torque the two M2x10 guiding screws until the M2x6 bolts can be easily torqued into the other three remaining screw holes easily without much force. Remove the two guiding bolts and replace with two M2x6 bolts. Do not fully tighten one bolt at a time. Torque the bolts in sequential order, until they are evenly tight. jason@RCCrawlerCountry.com Londonderry, NH 03053 Copyright © 2019 RC Crawler Country. All rights reserved.